UNITED NATIONS, September 15 -- So desperate was UN Secretary General Ban Ki-moon for media face time on Sunday that UN Photo came to his Sutton Place brownstone to photograph and upload the hand-over by Ake Sellstrom of the Syria chemical weapons report. Then dutifully two media spun even the photo, enlarging a dozen times and declaring -- no surprise -- that it says sarin was used. These were the Saudi Press Agency and an otherwise enterprising stringer for France 24. "On the basis of the evidence obtained during our investigation of the Ghouta incident, the conclusion is that chemical weapons have been used in the ongoing conflict between the parties of the Ghouta incident, in the Syrian Arab Republic UNREADABLE civilians, including children, on a relatively large scale. In particular, the UNREADABLE chemical and medical samples we have collected, provide clear and convincing evidence that...rockets containing the nerve agent sarin were used. This result leaves us with the deepest concerns." 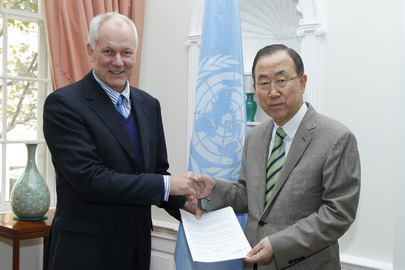 So why would Ban's UN take and upload such a photograph? Why did Ban, after saying he couldn't say this publicly, on Friday say on UNTV that Assad has committed many crimes against humanity? It's called the race for relevance, the most ham-handed of propaganda. How is this surprising from the national press agency of Saudi Arabia, the sponsor of rebel boss Ahmad al Jarba who was sponsored for a faux UN briefing by the UN Correspondents Association on whose Executive Committee the Saudi Press Agency garnered a seat by being a hatchet man? The 2013 president of this UNCA was spamming blind quotes about the report, from the UK / France, that the International Criminal Court must be invoked. We'll have more on this.